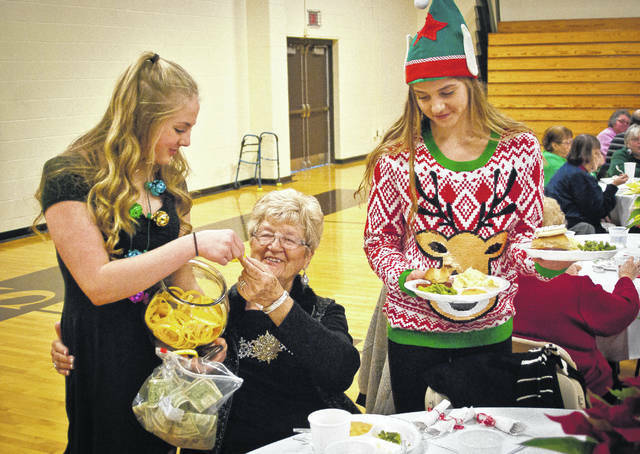 Connie Herd, center, is served lunch by her two granddaughters Hayle Romo, left, and Cameron Romo, right, during the annual Senior Citizens Concert and Luncheon at Buckeye Valley High School. The event was started in 1984 with 15 grandparents and has expanded to 300 senior citizens each year. Over 300 senior citizens packed the auxiliary gym of Buckeye Valley High School for lunch during the annual Senior Citizen Day. Generations crossed paths as Buckeye Valley High School students welcomed 300 grandparents and senior citizens to the annual Senior Citizen Day luncheon and concert last Friday. Miller said it’s good for the seniors to get a chance to see the kids and the older folks like the concerts. He said the kids love it as well by serving their grandparents lunch. Doug Joseph, the teacher who started the event, said it began in 1984 when students started to invite their grandparents to lunch in the cafeteria. He said at the time there were about 15 grandparents. Joseph said in the last 14 years, the school has hosted 300-plus senior citizens every year. He said the luncheon had to be moved to the auxiliary gym. Joseph said he told those in charge of this year’s event to expect the first guests to show up at 8:45 a.m.
After being treated to a concert and choral performance, the crowd went to the auxiliary gym for lunch. Students lined up with a plate in each hand at the serving tables for faculty, staff, and administration to load the plates with food. Students then walked the loaded plates over to the senior citizens waiting at the tables. Vic Griffin said it was his first time attending the luncheon and that he had been invited by his granddaughter, Ryan Haney. “This is the first time my grandchildren have been involved,” he said. Griffin said he found the performances by the band and choir to be special because Haney performed with both. It was also Connie Herd’s first year to attend the event. She went with her granddaughters, Cameron and Hayle Romo.